Annual herb from a fibrous root; stems decumbent (taller plants) to erect (smaller plants), several to many, unbranched to few branched, glabrous, 2-5 (15) cm tall. Basal leaves pinnate with 3-13 toothed or lobed segments, the segments oblanceolate, 4-10 mm long, sometimes again toothed, stalked, the stalks about as long as the leaves, glabrous, stem leaves similar, few. Inflorescence of single, terminal flowers on stalks about as long as the leaves; petals usually 4, white to yellowish, egg-shaped, 4-5 mm long; sepals usually 4, egg-shaped, sharp-pointed, with 2 rows of hairs at the base, 3-4 mm long. Wet depressions, vernal pools and seepage sites in the lowland zone; infrequent on SE Vancouver Island and adjacent islands; endemic. When in flower, Limnanthes macounii can be easily identified by its pinnate leaves and four-part flowers, but when lacking flowers it can be confused with four other taxa: Lepidium virginianum ssp. 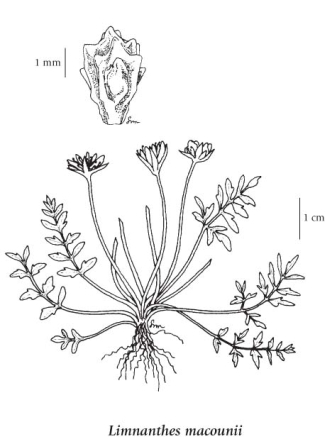 menziesii, Cardamine spp., Nemophila parviflora, and Nemophila pedunculata (Ceska and Ceska 2003). L. macounii can be distinguished from the first two species by the lack of a tap root and the presence of totally glabrous leaves. It differs from Nemophila species in having glabrous pinnate leaves (vs. non-glabrous, pinnatisect leaves).